We’re in between homes right now, with most of our life packed into an eclectic collection of recycled cardboard boxes. Anguel & I have been staying at my mum’s past for the past few weeks, living out a suitcase that we haven’t even had the time to properly unpack. While we feel uprooted and scattered at the moment, there are exciting things on the horizon as we spruce up our soon-to-be forever home (more on this soon)! But, amidst the chaos one experiences fixing up a dilapidated 100 year old house - where almost nothing feels like it’s going right - I felt the need to bake cookies. These Vegan Nutty Chocolate Chunk cookies came from a late night, stress-induced baking session. I was craving something sweet, but also wanted something chewy, crispy, and packed full of chocolate - and nuts. Basically, I wanted everything, and I wanted it now. With my usual pantry packed away, I had to use whatever I could find at my mum’s not-so-baking-stocked kitchen. A half eaten bar of dark chocolate. The jar of peanut butter that was left out after breakfast. A few handfuls of walnuts. The oats my mom stocks up on by the pound. It all started going into the bowl. In hindsight, this could have gone very wrong...but thankfully I was gifted some of the best vegan cookies I’ve ever had. These cookies are everything you should want in a cookie. The edges are slightly crisp, but the middle of the cookie is nice and soft. There are chunks of chocolate (both big and small) scattered throughout, and tiny pieces of walnut to add an extra oomph of flavor. Peanut butter adds more depth, creaminess, and binding power. And all this comes in a butter-free, eggless, almost-gluten-free cookie. I toyed with making this cookie entirely gluten-free, but to be honest, without my usual sets of starches or binders, I kept the all-purpose flour for good measure. 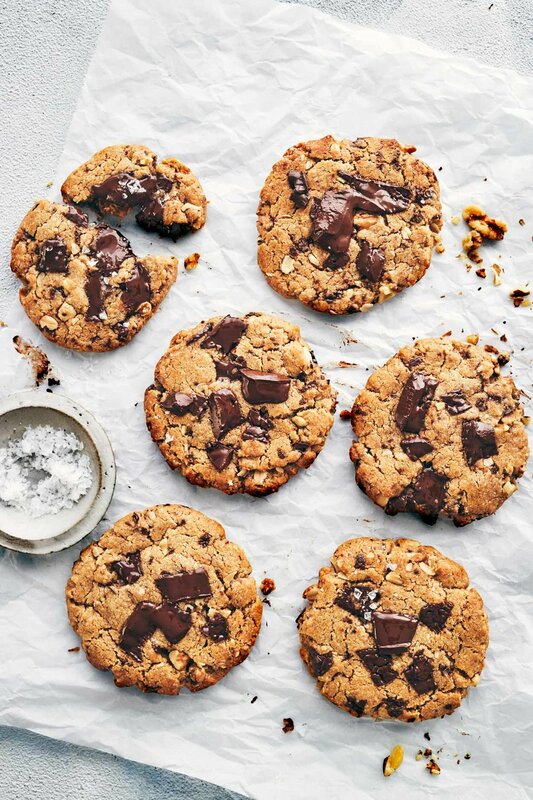 If you’re looking for a gluten free chocolate chunk cookie, check these ones out. All you need for this recipe is a spatula and a bowl. There’s no need for fancy beaters or a stand mixer here, so save yourself the trouble. Since these are essentially one-bowl cookies, it’s important to add the ingredients in the order that the recipe outlines, to ensure even distribution of ingredients. It might seem a bit odd to add the flax “egg” near the end, but because peanut butter is hydrophobic (i.e. repels water), I like to add the liquidy flax after the peanut butter has been incorporated into the mass of dough. The small amount of all-purpose flour also gets added near the end, so you can ensure everything else is well mixed, without the fear of overworking the gluten in the flour. If you’re following the recipe, there’s no need to worry about remembering all this, just wanted to share what I learned in the eight test runs I did for this recipe. Safe to say, we’ve been eating a lot of cookies! These cookies are tender right out of the oven and will firm up as they cool. Although tempting, do make sure you let them cool on the baking tray for at least 5-6 minutes, before moving them to the rack to cool completely. You can top them with a bit of flaky sea salt if desired. As much as I did away with most of my pantry for the past few weeks, I did manage to pack a small box of flaky salt into our suitcase. Anguel rolled his eyes when he found it, but it did come in handy for these cookies (pats herself on the back)! Store cooled cookies in an airtight container and enjoy. Preheat oven to 375°F. Line a baking tray with parchment paper, then set aside. In a small bowl, stir together ground flax and water until smooth. Set aside to thicken into a “flax egg”. Add rolled oats to a blender and process until it turns into flour. Very few (if any) oat pieces should be visible. Set aside. In a large bowl, use a mixing spoon to stir together smooth peanut butter, coconut oil and light brown sugar. The coconut oil will soften as you stir. Mix until no clumps of coconut oil remain, and the mixture is a smooth liquid. Then, stir in vanilla extract, baking soda, baking powder and salt until evenly incorporated. Add oat flour from the blender. Stir until fully combined. Next, fold in the “flax egg” mixture. Then finally the all purpose flour. Mix until the flour just becomes fully combined. Fold in finely chopped walnuts and chopped dark chocolate. Scoop dough into golf-ball sized balls. Use your hands to shape and flatten slightly on the baking tray. Bake for 12 minutes, or until the cookie edges begin to turn golden brown. Leave cookies on baking tray, undisturbed, for at least 5-6 minutes. The cookies will be delicate, so use a spatula to carefully transfer to a cooling rack to cool completely. The cookies will firm up slightly as they cool. If desired, sprinkle with flaky sea salt. -*Use smooth (not chunky), all-natural peanut butter. The peanut butter assists with binding the dough, so ensure you’re using liquidy peanut butter. Since all-natural peanut butter has a tendency to separate, make sure the oil is thoroughly mixed in before measuring and using.